Within a New York Observer report today about the quiet closing of News Corp.’s internal wire service Newscore comes the somewhat unsurprising revelation that the company’s iPad newspaper is "on watch" and will be reevaluated after the presidential election. 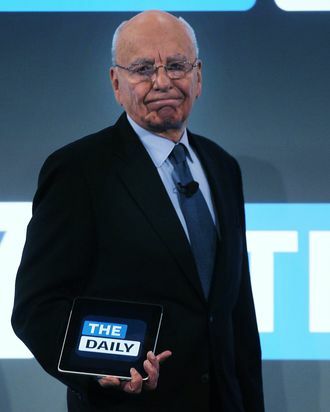 Rupert Murdoch’s news-of-the-future pet project is said to lose $30 million a year, a number that will stick out more sorely when the publishing business no longer has the profits of Fox News and the rest of the media division to hide behind. While the New York Post bleeds a similar shade of red, it at least has tabloid seniority.